Back in the days web designers could scan or draw a map and put it on the web but it was still very static. Maybe a user is interested, from his point of view, in an area or zoom level not covered on the static map? The Maps service of Google, initially called Local, revolutionized the way we look at locations on the web. Google Maps gives the user lots of freedom, zooming in and out on the map, changing the maptype from roadmap to satellite, or searching for directions between two points. 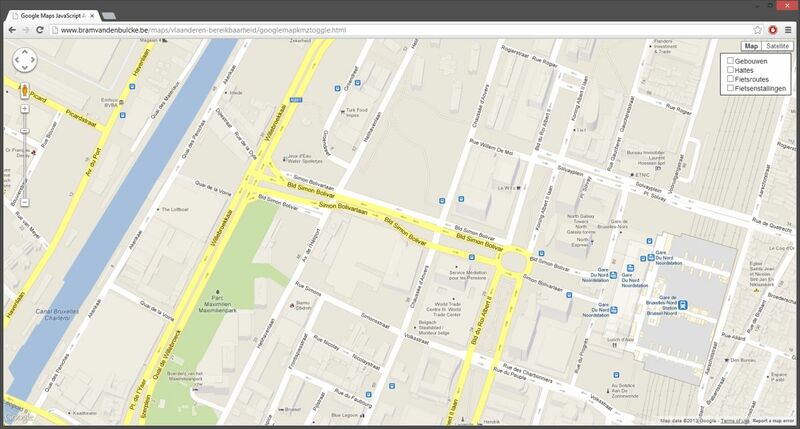 It is very easy to embed a simple Google Map on a website. Go to Google Maps, give in an address, click on Link and the code within an iframe will be included. Google also gives us the opportunity to customize the size of the map. While this is great, it only shows one point on the map. In some occasions, for example an event in a city, you want to show more points on the map. You could generate ten little maps with the tools Google provides us but that would look a little awkward. I will explain how to include a map with a custom checkbox, so the user has different proposed layers to show or hide. Google Fusion Tables is one of the newer features from Google. The data is stored in tables but can also be shown as charts or on a map. One of the biggest advantage of Fusion Tables lies in the fact that it gives end users the possibility to change the data accordingly. The coding can be done in advance and then the end user can change the addresses in the Fusion Tables. I searched for some public tabels with the localization of supermarkets and museums in Brussels. Not all the data is as clean as it could be but it gives a good indications of easy adjustments with basic data sets. // List with Fusion Tables. Upper layer must be the last one in the list. In the next step we select the fusion table layers. Note the ID to target the specific layer with HTML. See this link for a working example. Using kmz/kml in combination with the Google Maps API also tackles the profound weakness of Google Earth being unable to show a normal map. See this link for a working example. I moved from hosting company and I forgot to copy some files and folders. I fixed it. Your link shows a KML file on a webserver. When you point towards the location you will have nested checkboxes (at least if your KML file has subfolders). But this method isn't clean because it shows the path of the file. I have been looking for a method to show nested checkboxes with a cleaner interface, but I never found a way to do it. Sorry! I resized the map to 640 x 480 and the check boxes fall outside the map. How can I get them to overlay top of the map to whatever size map I create? Thank you. Use CSS positioning for the checkboxes, like position: absolute or position: fixed.